So gas prices are continuing to rise, and it’s not even summer yet. 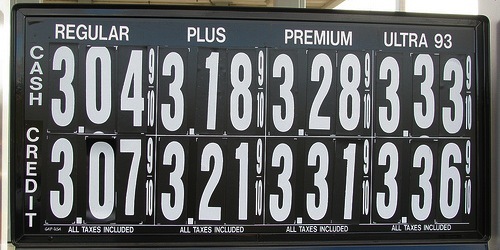 Many experts see gas prices per gallon shooting up to over $4.00 which is nothing short of scary. It’s really getting to the point where we can’t ignore the excessive price of gasoline. Before you could turn and cringe, and try to repress the fact that you were dropping $60-$70 at the pump each time you visited a gas station. But now it’s getting to the point where you stand and watch the dollar meter climb and climb as the gallon meter slowly, almost carelessly takes its sweet time to rise as your tank is filled. As the “gas crisis” presses on, activists have proposed outlandish gas boycotts and alternative means of transportation as a solution. But if you have to drive, you have to drive, and a lot of times there isn’t a viable way around it. Thankfully some of the credit card issuers have caught on to the problem and offered a bit of a solution with cash back rewards on everyday purchases like gasoline. This credit card reserved for seniors offers 3% cash back on gas all year round. The caveat is that you need to be 50 and a member of AARP to get the card. It also offers 3% cash back at restaurants, which is another perk if you enjoy eating out. And you can earn a $100 cash back bonus when you spend $500 within the first three months of account opening. The BankAmericard Cash Rewards credit card offers a full 3% rebate on gas up to $1,500 per quarter. Just keep in mind that gas and grocery rewards are capped together at $1,500 per quarter. It only offers 2% cash back on groceries, so it might be best to use just for gas anyway. A touch limited but if you use the credit card for gas only, you should be able to realize a 3% rebate for the majority of your gasoline purchases for the year. It’s not a bad credit card aside from the rewards aspect. It comes with no annual fee and 0% APR for the first twelve months, as well as cash back on everyday purchases and a $100 bonus when you spend $500 in the first 90 days.. This isn’t an outright gas rewards credit card, but the Chase Freedom does typically offer 5% cash back on gas during one quarter of the year up to $1,500 in total purchases. The maximum rebate you can earn for gas purchases during a quarter is $75. It’s certainly worth using when that quarter comes along, as it’s difficult to beat 5% cash back on gas. Earn 3X Citi ThankYou Points on gas purchases with no limit on how many points you can earn. You can also transfer points to a variety of airline and hotel loyalty programs, making the 3X rate potentially worth a lot more. This card offers the most cash back on gas of them all…a whopping 10%. However, it’s only offered at that rate on the first $1,000 in gas purchases made within a 90-day window from account opening. After that you can earn unlimited 5% cash back on gas for additional gas purchases made within that same 90 days, then it drops to just 1% cash back. So call this one a limited-time offer, but a potentially very lucrative one during that short period. This is one of the best new gas rewards credit cards out there. Earn 4% cash back on gas at Costco and other standalone stations (on the first $7,000 annually) and 1% back thereafter. Most people don’t spend anywhere near $7k on gas so most will earn 4% cash back on all their gas purchases. The hitch is that there’s an annual fee, though Costco members don’t pay it if they pay their membership. Similarly, the Discover it card offers rotating 5% cash back categories, with gas often offered not just one quarter per year, but two. So you can use this card half of the year and earn 5% cash back on all your gas purchases,with the same $1,500 spending limit. It also offers other handy 5% cash back categories, making it a worthwhile addition to your credit card stash. This gas credit card is reserved solely for PenFed Credit Union members comes with a staggering 5% cash back (5x points) on gas with no limit. That’s pretty unbeatable at face value. But the catch is that PenFed points might not actually be worth a penny depending on how you redeem them. So it might look better than it really is. Another no-brainer is the Sam’s Club MasterCard, which offers 5% cash back on gas purchases at both Sam’s Club locations and any other U.S.-based gas stations. The catch is that you only get 5% back on gas on up to $6,000 in purchases annually. Again, most people probably won’t exceed that high spend. If you happen to be a member of the military, or have family members in the Armed Forces, the USAA Cashback Rewards Plus American Express offers 5% cash back on gas. The caveat is that the annual limit is just $3,000, and the category is shared by military base purchases. So it can perhaps go quickly. Still, 5% cash back on gas is hard to beat. Then there’s the Wells Fargo Propel American Express Card, which offers 3X points at U.S. gas stations. It’s basically a good option if your best credit card is only giving you 2X or less on gas. For the record, I didn’t include any gas credit cards that only offer 2% or 2X because there are several credit card that offer 2% cash back or more on ALL purchases, year-round. One final credit card to consider is the Blue Cash Everyday Card from American Express, which offers 3% cash back on groceries, 2% cash back on gas, 2% at department stores, and 1% cash back everywhere else. *Even better is the old version of the card that comes with 5% cash back on gas once you spend $6,500 during your reward year. This is my card of choice. Also look out for specials from Amex and other issuers. I recently got this Amex Offer for 5X Membership Rewards points on gas all summer. There doesn’t seem to be a spending limit either.